Maria Thereza Alves, The Return of a Lake, 2012, installation, dimensions variable. This survey of Brazilian artist Maria Thereza Alves’s practice intelligently includes her seminal work Seeds of Change: A Floating Ballast Seed Garden, 1999–. Here, panels with pictures, maps, and texts dedicated to European port cities document her scrutiny of the connection between trade, the scattering of ships’ ballast flora, and landscape. Alves’s interest in ecology is her trademark, but this exhibition addresses her range through a selection of works focused on colonial themes, including the subaltern condition of native peoples across history. Take for example NoWhere, 1991, which combines scenic views of the Amazon rainforest via photographs, partially obscured by black painted doodles, with geometric patterns of wooden battens diagonally positioned on the wall. This installation smartly reflects on utopia, modern architecture, and the clash between American indigenous culture and European ideas. The exhibition’s peak is El retorno de un lago (The Return of a Lake), 2012, an installation that brilliantly encapsulates Alves’s key concerns. 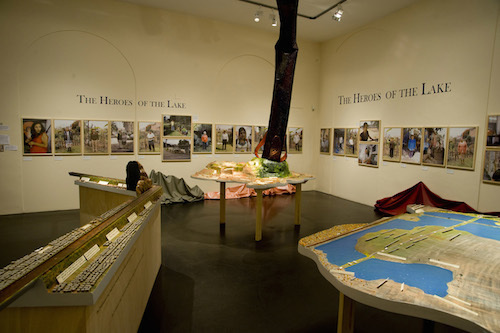 It consists of three elements: models of the Xico Valley region in Mexico; photographic portraits of its various inhabitants who are affiliated with a communitarian museum cofounded by Genaro Amaro Altamirano; and three-dimensional renditions of the Spanish empresario Íñigo Noriega Laso and his home village’s mansion. All together, they narrate the 1908 artificial desiccation of the Chalco Lake as orchestrated by Laso, an endeavor that caused severe environmental damage impacting the local population’s lives. Despite Altamirano’s efforts to call attention to the consequences of Laso’s project, he is still celebrated in Spain for it. This piece poignantly questions the amnesiac state of the European consciousness in regard to the effects of its imperialist enterprise.